Yesterday, I was dealing with fatigue, throbbing headaches, and a cold. It was also my "Saturday" yesterday, because I worked all weekend, worked on my online class, and didn't have a chance to catch my breath. Yesterday, I slept in late (it was awesome, and guilt-free), and I had a day off yesterday. It was absolutely wonderful. I decided to make some cookie dough (the idea actually popped into my head a couple days ago, but I decided to make it happen yesterday). It was so quick! I found a recipe on Pinterest, but I made it my own by changing it up. 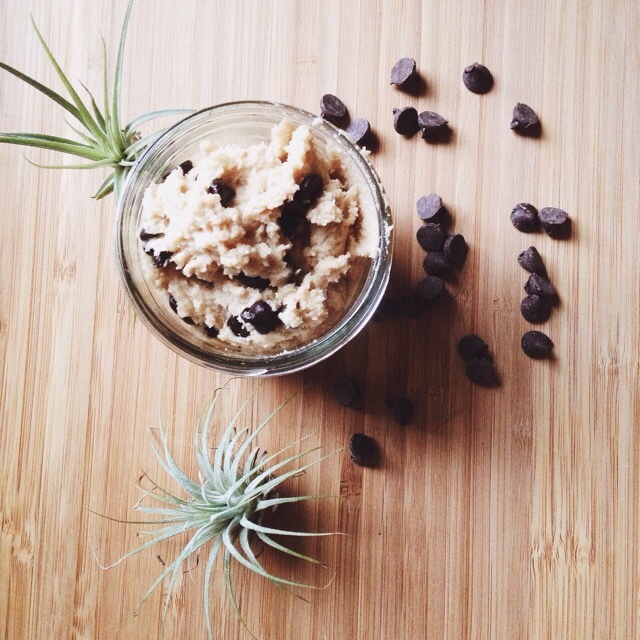 It is really good "snacking" cookie dough for those days you feel like eating a whole bowl of cookie dough. 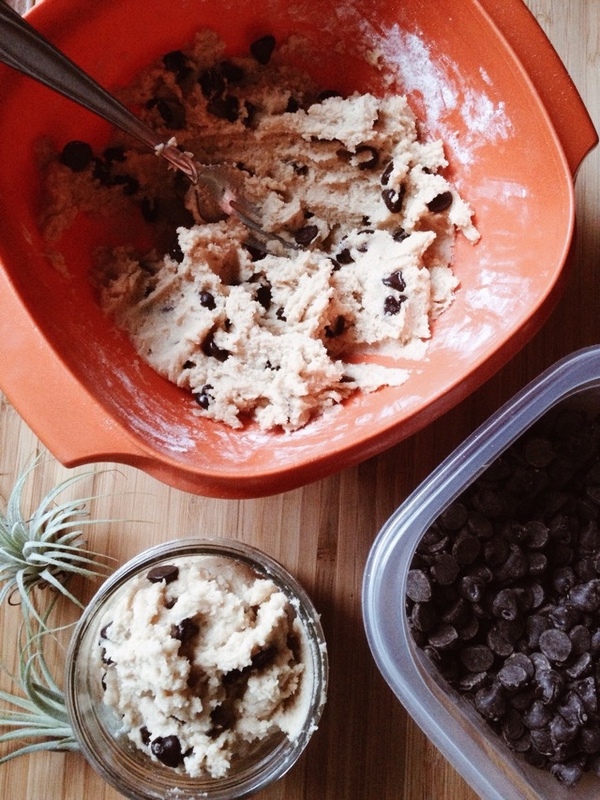 This cookie dough is actually very light, and you can eat a bunch without feeling sick. The regular cookie dough my family makes to actually make cookies with is pretty heavy, and after a couple of bites, you can't seem to eat anymore. That is because there is shortening, and so much flour in my family's cookie dough recipe. While it is so scrumptious, it is heavy, and it has eggs in it which is always makes eating that cookie dough a risk (although, we get the organic farm fresh eggs from the organic section, so the chances of getting salmonella are pretty slim). 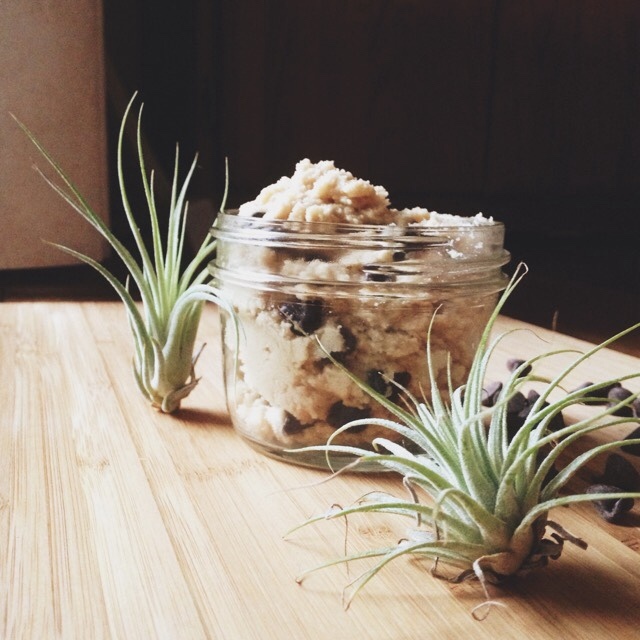 The lightness of this cookie dough recipe allows you to eat a whole bowl, or a whole mini mason jar in one sitting. It is so quick and so easy to make! First, cream the sugars and butter together with a fork. Remember the butter should be softened. Pop it in the microwave for 10 seconds to soften it. After the butter and sugars are creamed together, stir in the vanilla extract. Next, add in the flour, mix together, and add in the chocolate chips. Enjoy! This cookie dough is scrumptious and sweet. It really made for such a sweet, lazy day yesterday! I am glad got some good feedback about the cookie dough yesterday on social media. I was thinking about posting it, but I am glad other people wanted to see the recipe too. Cookie dough is one of my favorites! 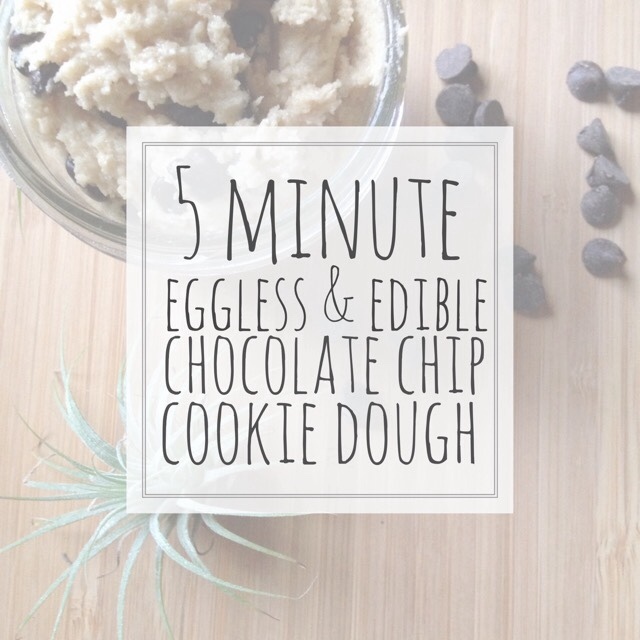 Edible cookie dough, now that is just perfect! Does anyone have a recipe for eggless & edible brownie batter? If so, I would love it!